While not a bad instinct to have, the desire to explore can be dangerous for your dog, especially when considering the hazards of vehicles on the road, chemical pools that you pet might be inclined to drink from, or other more dangerous animals. To protect your dog from these external dangers, Richard Peck invented the first invisible dog fence in 1973. These fences work by having a set zone that your dog can travel in freely. If your dog comes close to the boundaries of the zone, the lightweight collar that they wear emits a warning sound. If they breach the set boundary, then your pet will receive a mild shock. This Pavlovian response ensures the safety of your pet. There are currently several varieties of invisible fence on the market today, so we’ve done the research and come up with these four top rated products. When we grant the Gold Pick status to a product, you know that it is a quality device that has enjoyed rave reviews from both consumer and critical groups alike. Our Gold Pick wireless dog fence is a great device that has your pet’s safety and comfort at the core of its design principles. Setup right out of the box is easy, your dog will hardly notice the collar, and it will support an unlimited amount of dogs. Developed by the folks at Friendly Pet Products, this containment system is perfect for correcting your dog without adding to much stress to his or her daily routine. This is considered a fast setup unit. You simply establish the wire boundary by burying the included wires underground. These are high quality wires that will stand up to the elements and also have no dead spots for your dog to sneak through. Also, as some systems utilize a perfectly rounded protection area, you can sometimes encroach on a neighbor’s property; with this system you don’t have to worry about that as the wire is the limit of your dog’s roaming. This fence utilizes radio waves to establish the boundary, but it’s shielded to prevent signal interference. To deactivate the signal in an area, simply twist the wire tightly; the zone that is twisted will not receive any signal but the untwisted area will continue to work before and after the twisting. Setting up the transmitter is very easy as well. The device itself utilizes a fairly understated design that will fit anywhere in your home. Friendly Pet Products utilized a clamshell construction for this unit in order to protect the components and to allow for easy access to the controls. Along the front of the unit, you’ll find four switches; two red switches for the fence cord and two more for the ground. Directly to the left of these switches is a dial that will help you set the width of the boundary area. This scales from a zero setting all the way up to a ten. A really nice feature of the transmitter unit is the fact that it has a hole in the lid. When it’s powered on, you can see a red LED through the lid so that you know the unit is active. This serves as an extra layer of protection for your dog as when the transmitter has been accidentally powered down, you know that the boundary system is inactive. A problem for many of these types of devices is limited range. Luckily, the manufacturer found a great system that can take all limits off of the range of this unit. In the packaging, you are provided with a full ½ acre of training flags and fence cord. By purchasing additional flags and cord lengths from the manufacturer, you can increase the range of the system up to 25 acres. You’re probably thinking that this doesn’t sound unlimited, but you can increase this acreage to even greater distances by simply purchasing more transmitters that will increase the acreage protected by your device indefinitely. The larger the protected area, the more chance there is for your dog to encounter water in its roamings. These are electrically powered devices; and as a rule, electricity doesn’t play well with moisture. Fortunately, the collar for this device is waterproof, so your dog can take a dip from time to time in safety. Our Silver Pick is one of the first wireless pet containment systems on the market. Petsafe specializes in keeping your dog safe; they produce harnesses, safe toys, and training solutions that are perfect for potentially recalcitrant pooches. This system of electronic boundary management is quite different than the one featured in our Gold Pick, but overall, it can be even easier to set up. The first thing you might notice that differs in the pack-ins of our Silver Pick versus those provided by our Gold Pick, is that our Silver Pick doesn’t include any boundary wires. 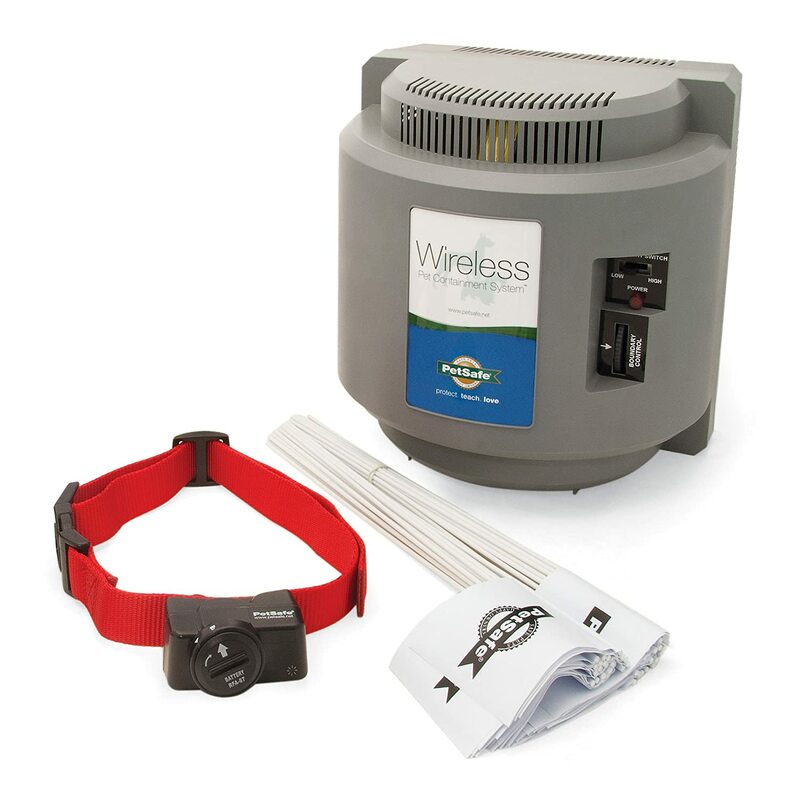 This is because the Petsafe unit doesn’t use buriable boundary wires to establish a perimeter; the wireless transmitter does. You simply turn on this radio broadcasting base station and it generates a completely circular field that covers a radius of about 90 yards or so. While this might seem like a small area, you can overlap units to provide a larger degree of coverage if you need protection for a larger area. An advantage of this system is that you can change the boundary radius with the adjustment of a dial. This is perfect if you have an older dog that you want to keep closer to the house, or if you have a smaller property and you don’t want to overlap into the neighbor’s yard. The collar itself is smaller than those offered in many invisible fence type units and is perfect for dogs as small as 12 pounds. The battery itself isn’t chargeable and will need to be replaced every few months. A great feature of this collar is the included variable studs. Do you have a shaggy dog? Simply replace the shorter studs with longer ones so that they actually touch the skin of your hairy friend. 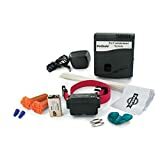 Also, the Petsafe collar includes five different correction levels that you can set on the collar itself; this gives you plenty of adjustability for particularly recalcitrant dogs who like to test their boundaries often. Our Silver Pick is a great option for managing your dog’s roaming, but there are considerations to be made before purchasing this type. Since this doesn’t use a in-ground system to create a visible fence, you might have dead zones. Household items that are made of metal seem to interrupt the field in spots. 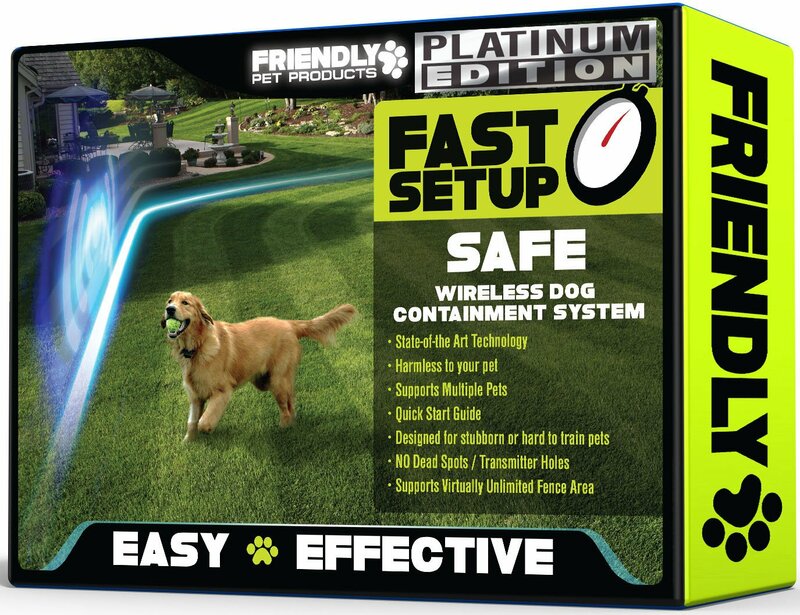 Also, any aluminum siding might cause the field to be interrupted, so consider this first when researching this Petsafe product. Finally, the field is somewhat variable, so while the visual cues will help your dog get an idea where his boundaries are, the field may constrict a bit from time to time. Luckily the tone will alert your dog well in advance of a static pulse. 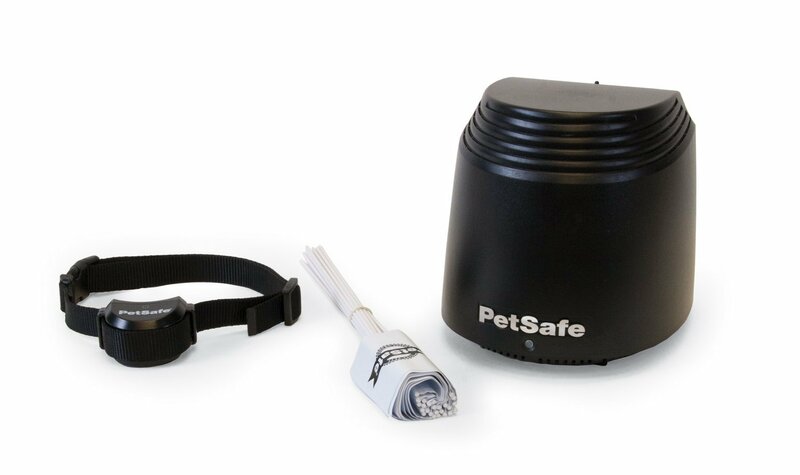 Another product produced by pet safety specialists Petsafe, the PIF00-12917 has a lot of similarities to our Silver Pick the PIF-300 but definitely differs in some key areas. 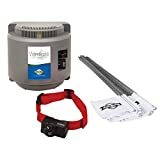 Both of these items exemplify Petsafe’s commitment to pet safety and each can work effortlessly with the other model to create a broader dog protection area. The base station unit for the projection of the boundary signal is black and slightly smaller than Silver Pick unit. Just like that unit, it’s recommended that you place this transmitter on a table that is at least three feet high, or place it directly on a wall by way of the mounting template that is positioned on the back of the transmitter’s housing. As this uses a radio signal to project the boundaries of your dog’s roaming area, you will want to keep this base station at least three feet away from any metal objects that might interrupt the signal. The unit itself will project a circular boundary for 90 feet from the center, covering a full 180 feet in diameter. If you need less than this area, there is an on-board switch that will allow you to shrink your coverage area to 45 feet from the transmitter unit. Also, with more collars, you can accommodate an unlimited amount of canines with this unit; they’ll all have the same boundaries and you’ll lose no reception by splitting the signal so many times. The collar itself differentiates from the one that is included with the PIF-300. As you may remember, the PIF-300 is powered by a replaceable battery that will last for a few months before it needs to be replaced. Tackling this flaw, the people at PetSafe decided to deploy a rechargeable system into this collar. The result is a slightly bulkier collar than the PIF-300’s but with an easier power-up profile. Simply charge the collar in a wall outlet for two hours (a detachable wire is included) and your pet will be protected for two to three weeks. This amount of time can vary though, dependent on how often your pet will receive a small shock because he or she is challenging the boundaries. The receiver collar also comes with variable prongs that you can select based on your dog’s coat length. Also, similarly to the PIF-300, a test light is included in the packaging of this invisible wall system; simply touch the test light to the prongs when establishing your perimeter, and it will light up when you near the edges. Wirelessly protecting your canines isn’t something that you have to spend a lot for. If you are ballin’ on a budget, you can still protect your dog from the rigors that freely roaming can pose. Our final budget pick is another unit produced by industry leaders Petsafe. It provides a lot of the safety features that are included in its sister products, but at a much lower price point. The base station works well;, it is wall powered and provides ten acres of full protection for your dogs that you can augment with more units and more in-ground wire. Since this collar is designed for larger dogs, you’ll notice that it is somewhat chunkier than the other collar systems on our list. To power the collars shock system, Petsafe utilized a 9 nine volt battery that will last a few months. All of the collars on our list emit a beeping noise as a warning, but this unit is the only one that also vibrates. This lends a tactile warning for the dog that is can make them think twice before the collar emits a shock. This collar also features the strongest correction level available. Once again, this is because it is designed for larger dogs, though the correction level is variable in case you are using it on a dog with a lower pain threshold like a pit bull. The range on these types of units varies from model to model. Also, remember that the containment zone is spherical, so you’ll have to consider where you position the central unit so that your dog doesn’t think that a neighbor’s yard is part of their territory. When purchasing one of these devices, learn the range of each so that you can make an informed decision on what type of system is best for you and your pet. Simply setting up the fence and hoping that your dog gets it when it receives a shock isn’t enough to ensure that he/she understands their boundaries. You’ll have to train your beloved pet to truly understand what the shock they receive from violations means to them. One technique that you can use is to set up some flags around the perimeter of the containment zone. This way your best friend will have visual cues that they can use to understand where the boundary zone lies. Take your pet to each flag so that his collar beeps, this will tell him or her that the collar makes this noise when they are getting too close to the shock zone. After the beep, give your pet either praise or a treat, this will reinforce the Pavlovian response that the collar enforces; get too close and you’ll receive a shock, stay within the boundaries and you’ll be rewarded. When purchasing one of these types of systems, understand that you’ll have to take some time out of your day to be sure that your pet fully gets what their boundaries are. Dog sizes vary greatly. A collar that fits well on a dachshund won’t necessarily be adjustable enough to accommodate a saint bernard’s larger neck. Also, some dogs are shaggier than others, so having a collar that has two different sized contact points for shorter or longer furred animals can be helpful for you when establishing a containment zone. When seeking out one of these invisible fence systems, be sure to consider your dog’s size and shagginess when selecting a model. A shock, even a mild one can cause damage to your pet if they are predisposed to certain conditions. Before you even consider purchasing one of these types of containment systems, be sure that your dog’s health can accommodate a small shock. Factors such as temperament, breed, and age can also contribute to the appropriateness of this style of pet management. If your dog is unsuitable for this type of collared electrical system, there are always traditional fence setups that can help curb your pet’s desire to roam freely. Since these devices utilize batteries to generate power, you’ll have to charge them from time to time for them to function properly. Most collars can last for weeks on a charge, but this is mitigated by how often your pet tests his or her boundaries. For the most part, they only take around two hours to fully charge, so there is a great ratio of charge time to battery life. When selecting a new electric dog fence, be sure to consider the charging time to battery life ration, so that you don’t have to continuously be charging your pet’s collar. Dogs love live the type of active lifestyle that many of us crave. If you have a pool, you can bet that your dog loves to wade around in it from time to time. A major question that you might have if you are looking into buying one of these types of invisible fence systems, is will your dog be safe in the water wearing an electronic device that is designed to deliver a mild shock to them under dry circumstances? Fortunately, there are several options for these types of collars that will allow your dog to experience aquatic adventure without posing any risk to their safety. Two of the collar receivers listed in this write up are waterproof. This means that half of the collars we’ve researched aren’t protected from water, so when you’re looking for a new wireless dog fence, be sure that if your pet likes to frolic in the water that you select a unit that is protected from moisture. As a pet owner, keeping your beloved animal safe is one of the most important concerns that you’ll face. Dogs like to roam, and in a perfect world, they should be able to explore to their heart’s content, but unfortunately, there are too many dangers that they can be exposed to in the real world. These types of collar systems can really make a difference in the safety man’s best friend, and selecting one that will work best for you will take a little bit of research. Consider our reviews and pre-purchase considerations before you select a new unit for your pooch.